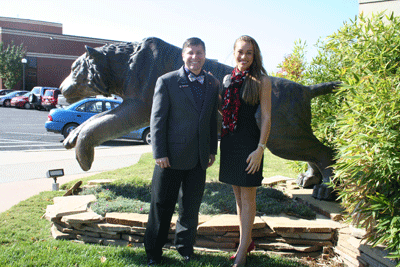 Hannah Wagner, Miss Kansas 2015, recently had an opportunity to tour Cowley College’s main campus in Arkansas City. Along with the tour of campus, Wagner had an opportunity to visit with Cowley College president Dr. Dennis Rittle and to thank the school for partnering with the Miss Kansas Pageant in offering In-Kind scholarships. Cowley provides an In-Kind scholarship to the winner of Miss Kansas and to pageant winners in area towns. “The In-Kind scholarship is amazing, especially for local women to have the opportunity to have their education paid for,” Wagner said. Dr. Rittle enjoyed having Miss Kansas on campus and believes Wagner is an inspiration to all women. “We are delighted to partner with the Miss Kansas organization to help young women make better lives for themselves,” Dr. Rittle said.